When designing a poster to display scientific research and results it can be hard to know where to start. Organizing information into individual sections and selecting an attractive and logical layout to display hours of work can be daunting, especially when faced with a blank page and a deadline. Using the free, customizable Scientific Poster Template from PowerPoint removes the uncertainty and streamlines the design process while still allowing users to create a totally individual end product that is ideal to display any kind of scientific research and results. First, download the totally customizable, easy-to-use Scientific Poster Template Power Point Document for free. 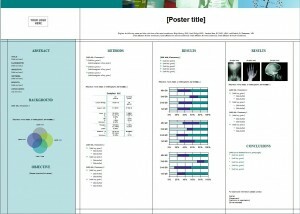 Second, separate project information into sections such as the ones shown on the Scientific Poster Template. Change existing section headings and add additional headings to the customizable template as needed to accommodate the project information and results. Third, fill out each section of the Scientific Poster Template with information about the project and add photographs, diagrams and charts to display results and add visual appeal. Keep a list of works cited throughout the project and while sorting project information. This helps avoid missing less obvious references that are easily overlooked in a last minute read through. Use large, easy-to-read fonts and select chart colors and images to be bright and eye catching to increase visual appeal and attract attention. Steer clear of neon colors and excessive ornamentation as they tend to be seen as less professional and can distract from the information being presented. Use a professional printing service to print the finished poster, using a single sheet print method on heavy card stock if available. Select a semigloss finish for a polished and professional appearance. Try not to fold the poster as creases look unprofessional and be aware that things can stick to glossy prints and ruin their finish. Displaying scientific results should be fun and exciting, not difficult or stressful. Use this template to make the design process quick and easy so you can spend more time researching and less time stressing about poster design and layout.